After falling off a steamship, a spoiled rich brat learns to be humble when he is rescued by a fishing boat and forced to work for his supper. Have you ever run into a little kid so arrogant, spoiled, and ungrateful for what they have that you just want to smack them? That perfectly describes the kid in "Captains Courageous." It is directed by Victor Fleming, who has directed a couple of little-known films called "Gone With the Wind" and "The Wizard of Oz." It is based on a novel of the same name by Rudyard Kipling. 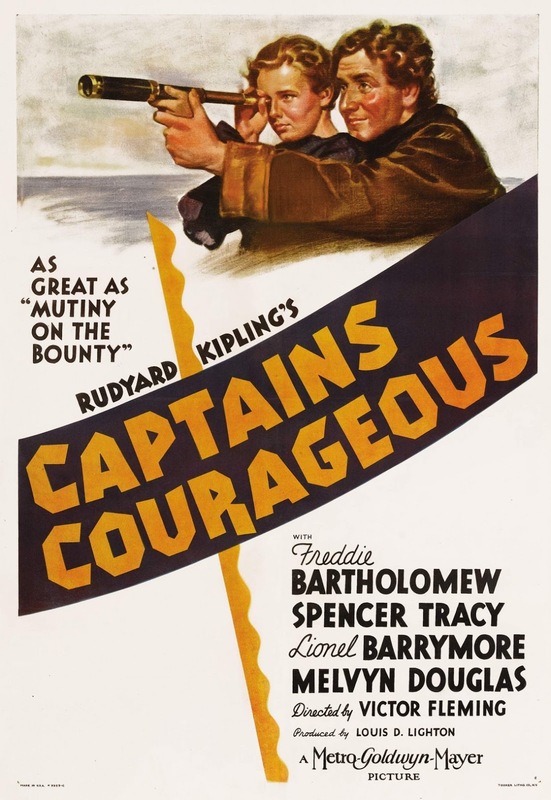 It stars Freddie Bartholomew as Harvey Cheyne, a spoiled, upper-crust rich kid who thinks he can do whatever he wants because of his influential father. After Harvey gets suspended from school, his father decides to take him on his business trip overseas. While on a steamship crossing the Atlantic, Harvey falls overboard. He is rescued by a Portuguese fisherman named Manuel, played by Spencer Tracy. Nobody on the fishing boat believes Harvey's stories about his rich father and the promise of a big reward for his swift return, so the captain of the ship, played by Lionel Barrymore, puts Harvey to work to pay for his meals, passage, and safe return once the ship makes port again, which won't be for some time. This is a film BigJ grew up watching. He would watch it on numerous occasions with his father, and it was one of their favorites to enjoy together. He will admit, he has a bit of a nostalgic connection and bias towards the film despite the fact that it came out more than 40 years before he was born and even a few years before his dad was born. Even without that connection, this is still a great piece of classic cinema with elements for the whole family. It is about the importance of hard work, honesty, and humility, a lesson every kid should learn. It shows that growing up with everything you want and not having to work for it doesn't allow a person to learn the value of a dollar. It shows how hard some people work for everything they have while others have everything handed to them. It is also about the importance of parents being there for your child and to be present in their lives and to show them right from wrong. The character of Harvey didn't have this since his father was always too busy with work to spend time with him despite loving him very much. Over the course of the film, Harvey develops a sincere father/son type of relationship with the man who rescued him, Manuel. Spencer Tracy won an Oscar for his portrayal of Manuel, though even he will admit he doesn't do a Portuguese accent very well, which is one of the worst parts of the movie. "Captains Courageous" was nominated for Best Picture, Best Screenplay, and Best Editing, though Tracy was the only one who took home a trophy. Overall, this is an engaging film that is both funny, heartwarming, and even a little exciting at times. There are some elements that are certainly of their time, but it mostly holds up even after decades.